What is area-wide management (AWM)? Why is it important? Area-wide management (AWM) is a proven, effective management approach for mobile pests around the world. AWM is used across a well-defined area or region, including all pest habitats within that area, to reduce the total pest population. Reducing the population across the landscape reduces the likelihood of that pest moving into farms and orchards from habitats such as backyard gardens and/or native hosts. AWM paves the way for incorporating sterile insect techniques. It is not easy to ensure all habitats in an area are appropriately managed but AWM requires that any control methods are coordinated and comprehensive. This coordination could be across neighbouring orchards, across urban neighbourhoods, or both. All community members, gardeners, growers and government staff need to be committed and to take part. AWM programs allow everyone to pool their resources and use methods that might otherwise be difficult to put in place by individuals. It is a long-term undertaking, with long-term solutions. Using AWM within a chosen region or area requires people to use integrated control tactics and is a preferred longer term strategy than relying on a single tool. An example of an AWM definition is: “control measures applied against a given plant pest over a geographically defined area that includes all known or potential hosts with the objective of preventing pest build-up while minimizing damage to commercial host. Control actions are conducted whenever and wherever the target pest exists regardless of host seasonality” (Enkerlin 2007). 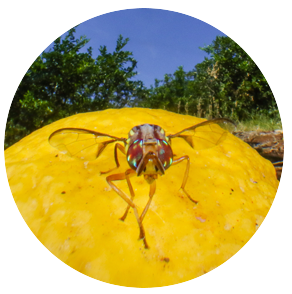 These guidelines are for people in eastern Australia who are interested in implementing or bolstering Queensland fruit fly (Qfly) management efforts in their region.They are most useful for groups who want to work together (neighbouring orchards, across an urban neighbourhoods, or both) to achieve coordinated, effective control. But if you are an individual commercial producer or backyard gardener, there is plenty of information about how you can benefit by more broadly managing your property. If you are in area with Qfly already established, this will help inform you about managing Qfly. If you do not have Qfly in your region, you can check on what your regulated fruit fly status is, and find out how to detect Qfly early to increase your chances of eradication. Work through the guidelines for coordinators, commercial growers, or backyard gardeners, and see how much you can achieve. Follow the steps that are relevant to you as a coordinator or member of a fruit fly group, commercial grower, or backyard gardener. There is plenty of information for you for each step along the way. These guidelines build on individual Qfly management tools, comprising currently available management practices to help you apply them optimally across your area in an AWM approach. We’ve also included all the science and research findings that have gone into this project. To view graphs and diagrams, click the image to enlarge. The ‘Adaptive Area wide management of Qfly using SIT’ project is being delivered by Hort Innovation as part of its Hort Frontiers Fruit Fly Fund, and is supported by funding from the Australian Government Department of Agriculture & Water Resources as part of its Rural R&D for Profit program, and CSIRO.